Yesterday the 2016 Nobel Prize in Physics was announced. I immediately got a few tweets asking for more information about what these “exotic” states of matter were and explain more about them… Well in short the prize was awarded for the theoretical discoveries that help scientists understand unusual properties of materials, such as superconductivity and superfluidity, that arise at low temperatures. Thouless, Haldane and Kosterliz work in a field of physics known as Condensed Matter Physics and it is interested in the physical properties of “condensed” materials such as solids and liquids. You may not know it, but results from research in condensed matter physics have made it possible for you to save a lot of data in your computer’s hard drive: the discovery of giant magnetoresistance has made it possible. The discoveries that the Nobel Committee are highlighting with the prize provide a better understanding of phases of matter such as superconductors, superfluids and thin magnetic films. The discoveries are now guiding the quest for next generation materials for electronics, quantum computing and more. They have developed mathematical models to describe the topological properties of materials in relation to other phenomena such as superconductivity, superfluidity and other peculiar magnetic properties. So, we know that all matter is formed by atoms. Nonetheless matter can have different properties and appear in different forms, such as solid, liquid, superfluid, magnet, etc. These various forms of matter are often called states of matter or phases. According to condensed matter physics , the different properties of materials originate from the different ways in which the atoms are organised in the materials. Those different organizations of the atoms (or other particles) are formally called the orders in the materials. Topological order is a type of order in zero-temperature phase of matter (also known as quantum matter). In general, topology is the study of geometrical properties and spatial relations unaffected by the continuous change of shape or size of figures. In our case, we are talking about properties of matter that remain unchanged when the object is flattened or expanded. Although, research originally focused on topological properties in 1-D and 2-D materials, researchers have discovered them in 3-D materials as well. These results are particularly important as they enable us to understanding “exotic” phenomena such as superconductivity, the property of matter that lets electrons travel through materials with zero resistance, and superfluidity, which lets fluids flow with zero loss of kinetic energy. Currently one of the most researched topics in the area is the study of topological insulators, superconductors and metals. 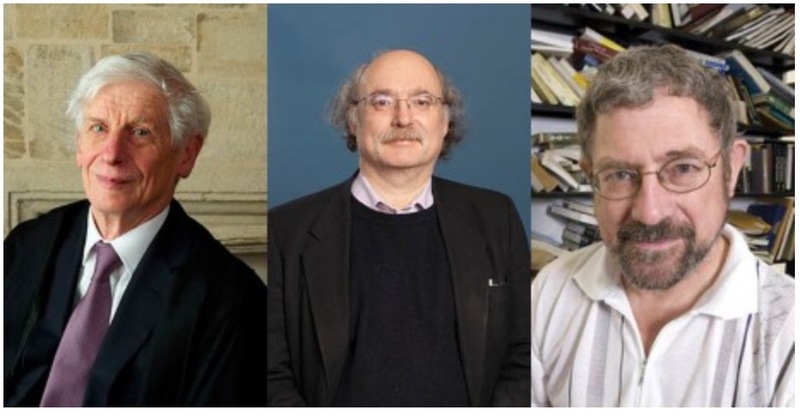 David Thouless, Duncan Haldane, and Michael Kosterlitz are to be awarded the 2016 Nobel Prize in Physics for their work on topological phases and phase transitions, the Royal Swedish Academy of Sciences announced on Tuesday. Thouless, of the University of Washington in Seattle, will receive half the 8 million Swedish krona (roughly $925 000) prize; Haldane, of Princeton University, and Kosterlitz, of Brown University, will split the other half. This year’s laureates used the mathematical branch of topology to make revolutionary contributions to their field of condensed-matter physics. In 1972 Thouless and Kosterlitz identified a phase transition that opened up two-dimensional systems as a playground for observing superconductivity, superfluidity, and other exotic phenomena. A decade later Haldane showed that topology is important in considering the properties of 1D chains of magnetic atoms. Then in the 1980s Thouless and Haldane demonstrated that the unusual behavior exhibited in the quantum Hall effect can emerge without a magnetic field. From early on it was clear that the laureates’ work would have important implications for condensed-matter theory. Today experimenters are studying 2D superconductors and topological insulators, which are insulating in the bulk yet channel spin-polarized currents on their surfaces without resistance (see Physics Today, January 2010, page 33). The research could lead to improved electronics, robust qubits for quantum computers, and even an improved understanding of the standard model of particle physics. When Thouless and Kosterlitz first collaborated in the early 1970s, the conventional wisdom was that thermal fluctuations in 2D materials precluded the emergence of ordered phases such as superconductivity. The researchers, then at the University of Birmingham in England, dismantled that argument by investigating the interactions within a 2D lattice. Thouless and Kosterlitz considered an idealized array of spins that is cooled to nearly absolute zero. At first the system lacks enough thermal energy to create defects, which in the model take the form of localized swirling vortices. Raising the temperature spurs the development of tightly bound pairs of oppositely rotating vortices. The coherence of the entire system depends logarithmically on the separation between vortices. As the temperature rises further, more vortex pairs pop up, and the separation between partners grows. The two scientists’ major insight came when they realized they could model the clockwise and counterclockwise vortices as positive and negative electric charges. The more pairs that form, the more interactions are disturbed by narrowly spaced vortices sitting between widely spaced ones. “Eventually, the whole thing will fly apart and you’ll get spontaneous ‘ionization,’ ” Thouless told Physics Today in 2006. Unlike some other phase transitions, such as the onset of ferromagnetism, no symmetry is broken. The sudden shift between order and disorder also demonstrates that superconductivity could indeed subsist in the 2D realm at temperatures below that of the KT transition. Experimenters observed the KT transition in superfluid helium-4 in 1978 and in superconducting thin films in 1981. More recently, the transition was reproduced in a flattened cloud of ultracold rubidium atoms (see Physics Today, August 2006, page 17). Thouless then turned his attention to the quantum foundations of conductors and insulators. In 1980 German physicist Klaus von Klitzing had applied a strong magnetic field to a thin conducting film sandwiched between semiconductors. The electrons traveling within the film separated into well-organized opposing lanes of traffic along the edges (see Physics Today, June 1981, page 17). Von Klitzing had discovered the quantum Hall effect, for which he would earn the Nobel five years later. Crucially, von Klitzing found that adjusting the strength of the magnetic field changed the conductance of his thin film only in fixed steps; the conductance was always an integer multiple of a fixed value, e2/h. That discovery proved the key for Thouless to relate the quantum Hall effect to topology, which is also based on integer steps—objects are often distinguished from each other topologically by the number of holes or nodes they possess, which is always an integer. In 1983 Thouless proposed that the electrons in von Klitzing’s experiment had formed a topological quantum fluid; the electrons’ collective behavior in that fluid, as measured by conductance, must vary in steps. Not only did Thouless’s work explain the integer nature of the quantum Hall effect, but it also pointed the way to reproducing the phenomenon’s exotic behavior under less extreme conditions. In 1988 Haldane proposed a means for electrons to form a topological quantum fluid in the absence of a magnetic field. Twenty-five years later, researchers reported such behavior in chromium-doped (Bi,Sb)2Te3, the first observation of what is known as the quantum anomalous Hall effect. Around 2005, physicists began exploring the possibility of realizing topological insulators, a large family of new topological phases of matter that would exhibit the best of multiple worlds: They would robustly conduct electricity on their edges or surfaces without a magnetic field and as a bonus would divide electron traffic into lanes determined by spin. Since then experimenters have identified topological insulators in two and three dimensions, which may lead to improved electronics. Other physicists have created topological insulators that conduct sound or light, rather than electrons, on their surfaces (see Physics Today, May 2014, page 68). Haldane’s work in the 1980s on the fractional quantum Hall effect was among the theoretical building blocks for proposals to use topologically protected excitations to build a fault-tolerant quantum computer (see Physics Today, October 2005, page 21). And his 1982 paper on magnetic chains serves as the foundation for efforts to create topologically protected excitations that behave like Majorana fermions, which are their own antiparticle. The work could lead to robust qubits for preserving the coherence of quantum information and perhaps provide particle physicists with clues as to the properties of fundamental Majorana fermions, which may or may not exist in nature.